I was walking through my neighbourhood and caught the glowing lights of a sign that read “AAA”. I was intrigued. I had no clue what it meant. There has been so much change in Toronto’s Old Town (St. Lawrence Market/King Street East Design District/Distillery District/etc.) that I couldn’t imagine what it could be. Though the speed of growth drives me crazy most times, one key benefit has been the surge of new businesses, and most importantly, new restaurants & bars to discover! With some cleaver searching (it is hard to find a twitter address only knowing 3 letters!) I was able to find their twitter account and exchanged a couple tweets. In one tweet they said “come in, we don’t bite”. I could tell that it would be a casual establishment but that it would also have a menu that probably reflected their laid back and welcoming personality. We walked in and sat at a booth. I gave it is quick once-over and decided I could best describe the joint as a ‘contemporary Texas saloon’. John Wayne was on the wall but ‘contemporary’ mostly because of the light fixtures and flat screen TVs. The staff was nice and handed us our menu. I wasn’t sure if I was going to want to stay because I LOVE options and this menus only featured 5 main dishes and 4 sides. Turns out, they were enough! Between the 3 of us, we ordered the Texas Chilli, the Chicken & Waffles and the Dry Rub Ribs with 2 sides of potato salad. It was REALLY GOOD. We all tried each others’ food without shame. Reaching over each plates, moving bowls and plates aside to get another taste. It was that good. Overall, I’m not a huge fan of the ‘all meat’ menu, but I get it. If you like BBQ, you’ll really like AAA. I think I’ll come back for a few tequila shots with some friends next time I’m looking for a spot to have a drink. 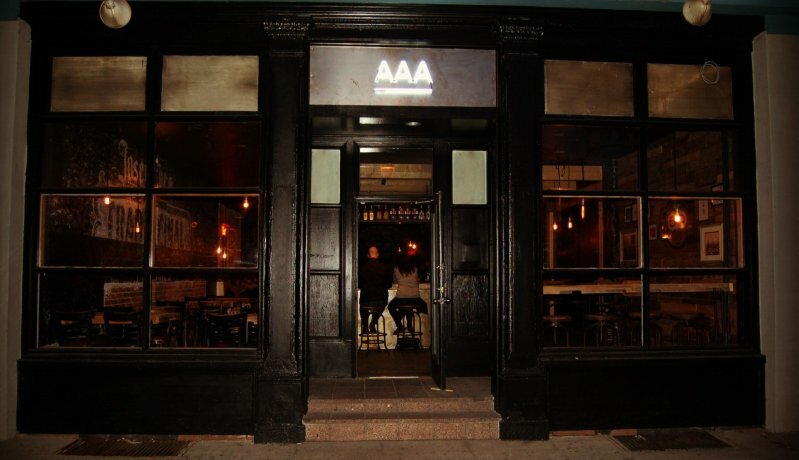 What they say: AAA is a Texas inspired (but still uniquely Canadian) bar catering to adults & families alike. BBQ Smoked Brisket & Ribs. Full Bar & Beer on Tap. TVs & Free wifi. What it is: Cool place to hang if you are looking to hang-out with a friend or two. Good alternative to The Bier Market row on Esplande. Great if you are looking for a after-work hang-out spot. Address: 138 Adelaide Street East, Toronto, ON (a few paces west of Jarvis Street on the North side of St. James Park).